When a parent contacted the Babyology Helpline for advice on her daughter’s nose-picking habit, other sympathetic mums and dads had plenty of helpful advice. Lots of parents were very familiar with this issue and keen to share their experiences. While some had success in halting their child’s enthusiasm for this practice, others thought it was part of kids’ natural development and was best overlooked. “She’ll eventually learn to do it in private! On the upside they say kids who eat their snot are healthier,” one parent posted cheerily. They’re kinda right. A study published in Applied and Environmental Microbiology, concluded that eating snot has health benefits, including preventing cavities and infections. Who even knew?! Some parents thought the opposite though, and adopted a scaremongering approach which they said seemed to work. 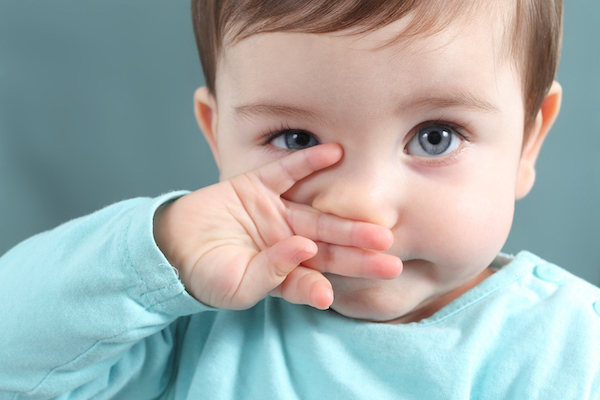 One mum said distracting your child each time she starts to nose pick can help to break this pesky habit. Others still thought making nose picking more unpleasant could be the key. All that said, plenty of experienced mums and dads said it’s best to ignore this habit altogether. “Ignore it … sometimes when you make a fuss the problem just gets bigger,” one mum advised. “It’s a phase. The more you react to it the more she’ll do it,” another agreed. Is bathroom picking the solution? The experts tell us that there’s no harm in kids picking their nose unless it becomes obsessive. While there may be health benefits to picking your nose and eating it, it’s not really socially acceptable. If you’re not able to ignore it, one compromise is to teach your child how to pick her nose in a way that’s more appropriate – like in the bathroom, perhaps? Throw in a tissue to help tidy things up and some hand-washing afterwards and it’s almost bearable – and a lot less embarrassing. One expert thinks this “nose picking in the bathroom” strategy is the best approach, especially if this gross habit is driving you nuts.